Back in early June while we were still in Tokyo we got an e-mail from our next door neighbor, Sharon Garcia. She told us a great big snapping turtle had walked up our shared driveway, dug a deep hole in her garden and laid about 20 eggs. The whole neighborhood stood around and watched while this was happening. They even took a video of the egg laying and sent it to us. When we got home at the end of June we found Sharon had placed little pink flags all around the spot where the eggs were laid. For the last three months, we have walked past those pink flags and wondered if the eggs would ever hatch. Sharon got a little impatient and even planted a few mums on the spot. Well, as nature would have it, this past weekend while I was in Washington, Ken and our friend Millie found a little brown lump moving up our walk towards our side door. Millie picked it up and asked Ken what it could be. 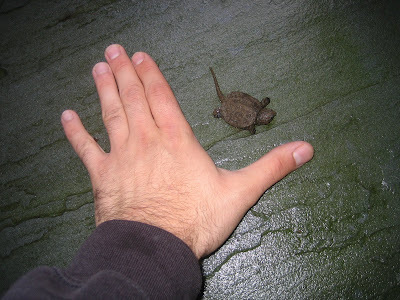 Lo and behold it was a little baby snapping turtle. Sharon's son Andres found a second one also in the driveway. Both babies were taken down to the stream at the end of our road where their mom came from. Now, we're all on the look out for the rest of the crew. Here's a picture of that little critter next to Andres' hand. SUPER BIEN!!! I LIKE IT.